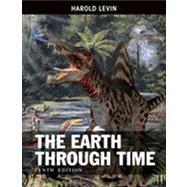 The 10th edition of Earth Through Time, by Levine, offers many new and enhanced features including more than a hundred new figures, 75 new questions at end of chapter "Questions for Review and Discussion", and additional "Enrichment Boxes". Furthermore, new sections, including, A Variety of Paleozoic Living Strategies, The Theropod Ancestry of Birds, Cenozoic Climates: Warming Then Cooling, and What Lies Ahead for Humanity have been added. Revised and brought up-to-date discussions are also included such as: Geology Lives in the Present and in the Past; When the Mediterranean was a Desert; Geologic background of Charles Darwin; and Ferdinand Hayden and the geological exploration of the American West to name a few. Revised Geological Time Scale is also included to conform to most recent recommendation of the International Congress on Stratigraphic Nomenclature. As well as revised figures Pathway Through the Proterozoic, Pathway Through the Paleozoic, Pathway Through the Mesozoic, and Pathway Through the Cenozoic which summarize the events described in an Era's history.